Just before Thanksgiving, we spent the day at the waterpark at Massanutten Resort. It is expensive ($38 for over 42″, $28 for under 42″), so it was a splurge for our family, but we all had a fantastic time and the kids loved it. This structure is the focal point of the indoor park. It features a variety of slides, sprayers, and of course a giant dumping bucket. The water level in this area does not get higher than a few inches. My 3 1/2 yr old LOVED this area. He would come down a slide and go racing back up into the structure. One of my few negatives about the park is that there was no one place I could stand and keep him in my line of sight. The nature of the structure had him constantly escaping my view. Thankfully, there are lifeguards everywhere and they seemed very attentive. There are also life jackets available, which we started out using, then later did without. This lazy river encircles the Massanutten Meltdown. This was a favorite of my 8 year old. She found a friend and floated on this thing at least 8 times in a row. There is only one point of entry and exit and again, life guards are posted throughout. You are required to stay with your tube, because a riderless tube presumably means someone is in trouble. I liked that they had single tubes, double tubes, and even double tubes with one side with no hole. That meant a little guy could sit in the middle. The entrance to this area has a zero-depth beachfront. The picture above also shows the non-water aspect of the resort. There is seating with a snack bar on the lowest level (inside the water park). The upper two levels contain an arcade, restaurant and gift shop. The frog pond is an area designated for little kids. 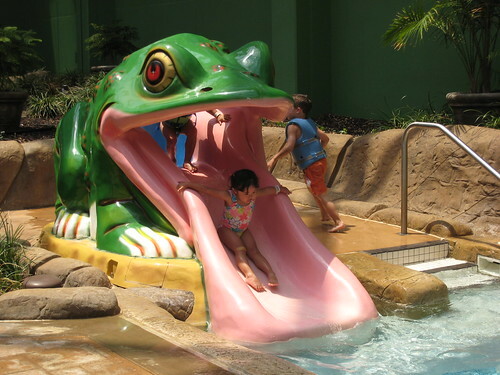 It has this cute frog slide, some mini sprayers and some adorable bouncy seats for babies. I didn’t get a good picture of this area, so the following pictures are from jinjin2000 on Flickr. There are three tube slides and they were a huge hit for everyone in our family (over 42″). You ride down these inclosed tubes on an inner tube — they have the option of single, double, and triple tubes. The option of a triple and double tube made it possible for our family of 5 to ride together. There are also two body slides you can go down — I didn’t like these as much but Sam and Daddy had fun on them. Shenandoah Cove is a small swimming area with a depth of 36″. Surprisingly, no one in our family was interested in this area. There are two hot tubs — one is for families and my kids loved hanging out in here. The water is tepid at best, but they loved being in the “hot tub”. There is another, adult-only hot tub tucked in another corner of the park. I took a break in there once and it was superbly hot and relaxing. The Pipeline is another big draw for the water park. It simulates surfing on the FlowRider. Daddy and the big kids tried it. Mr. Meanest did great, but both kids had wipeouts that left them not wanting more. The operators do a good job of teaching the riders what to do. In addition to the indoor facility, there is also an outdoor component. Of course, that area was closed when we were there in November. All in all, our family had a really fun time. It is an expensive outing, and outside food and drink are prohibited, so you end up spending more on junk, and even more in the arcade afterwards, but for a special outing, we had a great time. "Massanutten Indoor Water Park", 5 out of 5 based on 1 ratings. I’ve never heard of this place – it looks awesome! Thanks for posting! Looks like so much fun! I’m going to show this post to Chris and see if he wants to go soon. 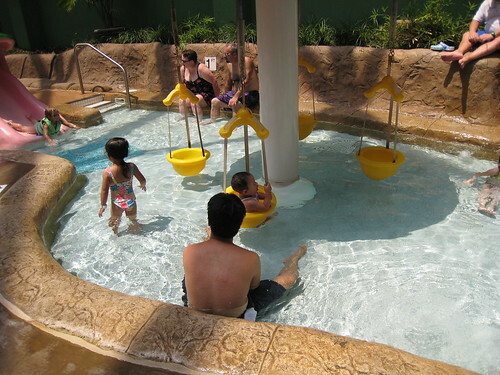 Our family enjoyed the water park too. One thing I would add–don’t forget towels. 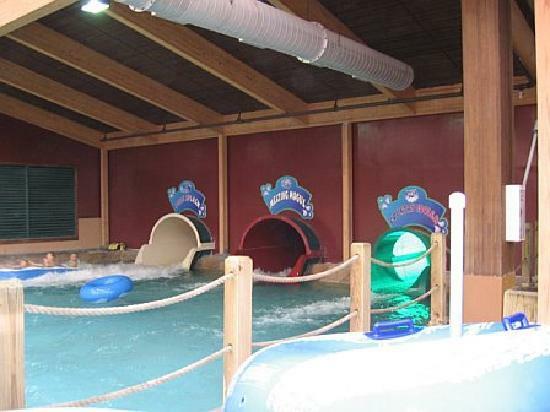 Unlike the water park at Great Wolf Lodge (another fun family outing), towels are not provided. We had to buy $25 a piece towels that were thin at best, from the gift shop. It is sooooo cool I went there before and it is awesome!!!! !